I get the impression Verso Group (UK) Ltd have given up actually talking to us - we have tried calling back many times, and offered to meet with them in our offices as he said "I'm going to come down to your office" after his 10:30 meeting last week - we were there and waiting, me and a solicitor (after all, he made several legal threats)... 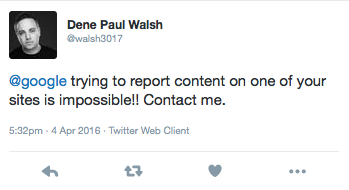 But I get the impression he may be trying to contact blogspot now. Of course, that may be unrelated. It may be that there are more people than just myself causing him some concern. I could not possibly comment. I posted on 17th March (here), but please note, whilst I mention Verso Group (UK) Ltd, I explain that it is only "apparently" a call from them - listen to the recording (which you don't host) and you will hear why, and the clear statement that the call is recorded to be posted in the public domain (Facebook). There is a clear statement from the caller that it is Verso Group and he confirms Verso Group (UK) Ltd calling as well as the call being from 02081507530 which is one of their numbers. I posted on 6th April (here) which is a post to clarify matters as someone claiming to be from Verso Group (UK) Ltd (Dene Walsh himself, I assume) asserts that the call in question is not from them. I make that crystal clear in that post. This call recording is apparently not a call made by them. Given that it is not a call by them I am not sure they have any legal reason to suppress it. I posted on 8th April (here) with a purely factual link to an OFCOM news item investigating Verso Group (UK) Ltd. The call recording is not hosted on blogspot! I own copyright in the call recording, and if you listen to it (here) you will hear that the caller is giving permission for it to be published on Facebook, where it is. I do not see that this is any concern of Verso Group (UK) Ltd if they did not make the call. Given that I have made it clear that the recording is apparently not made by Verso Group (UK) Ltd, it is clear that no matter how stupid, idiotic, ironic, moronic, or ill informed, the caller sounds, or how unlawful such a call is to a TPS registered number, that is not in any way defamatory of Verso Group (UK) Ltd, as they were (apparently) not the one making the call. I can't see it is defamatory at all, but if it was, then it is defamatory of the unknown caller and not of Verso Group (UK) Ltd, as they are apparently not the caller. I have offered to help - I am happy for the call recording to be used as evidence in pursuing someone impersonating Verso Group (UK) Ltd. Indeed, I am happy to contact the call provider, Andrews & Arnold Ltd, to try and get the call traced to the real source and identify the spoof caller to assist in enquiries. Indeed, I may do that anyway - wouldn't it be funny if it really was a call from Verso Group (UK) Ltd after all - but that is purely amusing myself with speculation and not to be taken seriously in any way. Anyway, Blogspot, if someone makes a complaint, feel free to contact me, and my solicitor will be happy to discuss the matter with you right away. P.S. was I bang on? This is getting rather interesting. I always wonder why anyone bothers blocking anyone from seeing their tweets. What's the worst that can happen? You'll have to take all your content and stick it on a wordpress on your own systems? If you look at the tweet (https://twitter.com/walsh3017/status/717027123769303040) that nobody (not even Google) has even bother responding. "Enjoy free, indemnified and unlimited legal advice – just a call away for DMA members." Now I'm curious: Since you've told us that he's blocked you, if we were to monitor his Twitter feed for "relevant tweets", an forward those to you (such as via screen capture) would that be a terms-of-service or other violation? If he still tweets publicly, I can presumably look at them whilst not logged in!